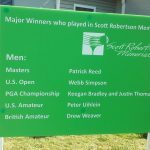 Some of the best young amateur golfers in the region, the country – even from around the world – will tee off for three days starting May 18th at Roanoke Country Club, during the 35th annual Scott Robertson Memorial Tournament. Chairman Tim Bibee says past participants – male and female, grouped 14-and-under and 15-to-18, have gone on to do very well. Proceeds from the Scott Robertson Memorial tournament benefit the First Tee Roanoke Valley youth golf program.